For decades, enterprises have been using paper based, spreadsheet or emails to capture field data and send it to their back-office systems for maintaining a system of records. Field personnel would capture information on paper forms and the data collected thus would sometimes be lost in transit. Moreover, data entry personnel would also make mistakes owing to illegible handwriting and manual errors. All these errors resulted in a lot of time wastage and huge costs. With the advent of mobile technology, the old paper-based system has become a thing of the past and enterprises are looking for ways to make their operations smarter and empower their employees by using their smartphone. 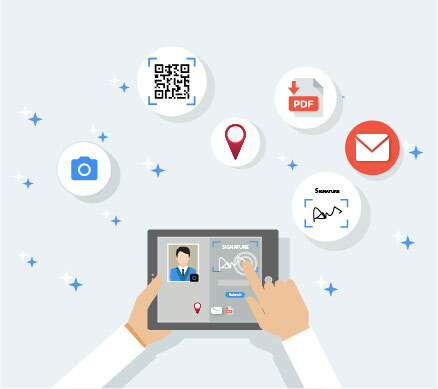 With Streebo Mobile Forms, enterprises can quickly create a mobile data collection app to ensure high quality data is captured leveraging mobile device features like GPS, Camera, E-Signature along with features like pre-populated fields and workflow automation for driving productivity ! Automatically capture the location of the form entry. Sending geo and time-stamped data anywhere, anytime is now possible!